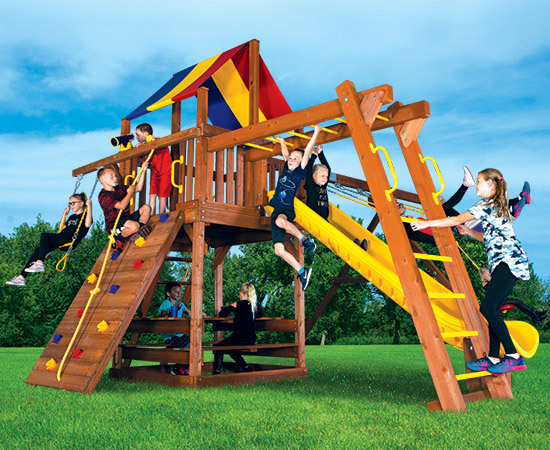 Rainbow Play Systems is 1,800,000 children strong and growing, with over 600,000 wooden swing sets installed worldwide! Your child can blast off on their very own Rainbow ® swing set, rocketing to the moon, sailing the seven seas, or commanding a circus. 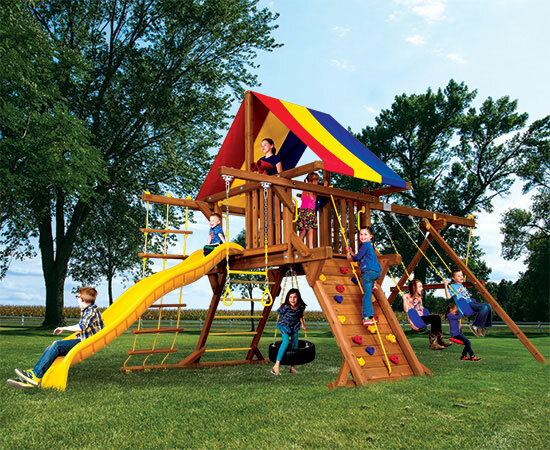 With their imagination and Rainbow Play Systems outdoor playsets, there are no limits to where they can go! We design and create redwood and cedar swing sets; as well as countless swing set accessories and options. This allows freedom to design the ideal outdoor playset for your family. For both healthy and safe fun, Rainbow Play Systems assures that every Rainbow ® swing set is built with quality craftsmanship with every child’s safety in mind. Rainbow Play Systems has over 200 showrooms worldwide, providing professional delivery and installation. Each and every swing set is backed by the best Lifetime Warranty in the business. 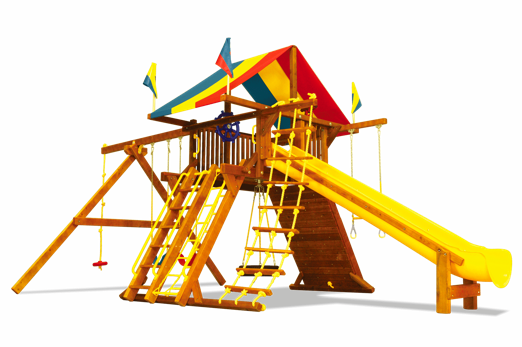 The Castle swing sets have an open play design, which produces an abundance of room to go up, down and all around for even the most energetic little ones. What makes a Castle a castle? Clubhouse playsets are a great solution for compact yards. Create a unique and imaginative space for your kids by adding the lower-level playhouse or the upper-level cabin package. What makes a Clubhouse a clubhouse? Rainbow has been building top-notched Commercial Playgrounds since 1990! We bring our 33 years of experience in building quality playgrounds to your schools, parks, churches, day cares, wherever children may play! Rainbow proudly offers a line of ADA Accessible playsets. All playsets displaying this symbol meet the Americans with Disabilities Act Accessibility Guidelines. Rainbow’s Commercial Playground Equipment meets or exceeds ASTM Safety Standards for public grounds. The sturdiest free standing playsets in the world are made by Rainbow Play! Find out why our structural integrity is second to none. 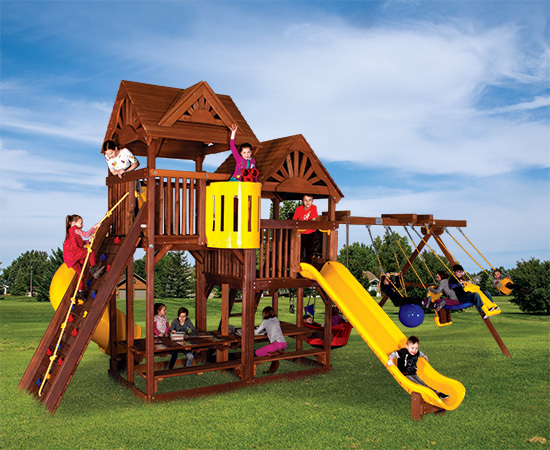 Our playsets are truly designed to last a lifetime. Discover how our industry leading warranty ensures years of intensive play. When you see the Rainbow plaque, you know you are getting the highest quality playset available. 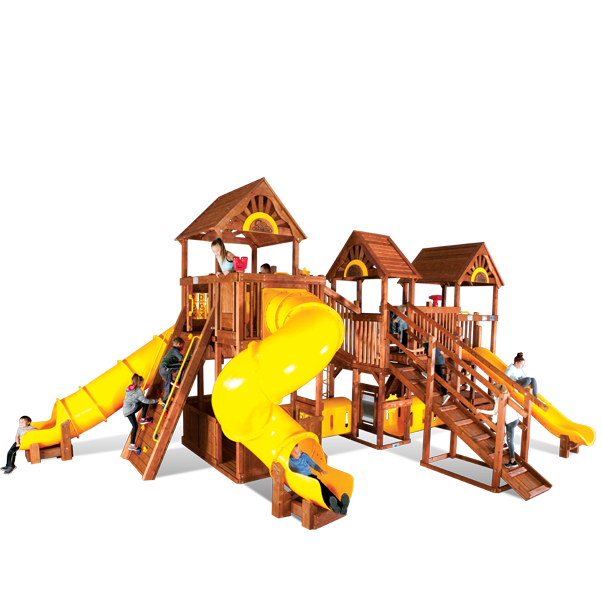 Every playset is backed by our exlusive lifetime warranty which means it will truly last a lifetime. Explore what makes a Rainbow different than any other playset option. Extra attention to detail & safety includes recessed hardware throughout the play structure. The recessed hole has a routered edge & the bolt is double nutted capped off with an acorn nut. Essential for long lasting and durable structure. The notches that are cut into each end of the brace are designed to gain maximum support by bracing wood against wood. This greatly reduces the force on the lag bolt that holds the brace in position. Plastisol Dipped Safety Handles reduce slipping as your child pulls themselves up or lowers themselves down. Plastisol is extremely durable and won’t chip or scratch. It also insulates the handles from the heat or cold. Rainbow only uses 1″ thick rope – no thin 1/2″ or 5/8″ rope. Utilizing a full 1″ diameter rope creates an easy to grab rope, very large knots and eliminates tangling. Rainbow’s Super Scoop Slide is designed to keep kids in the center all the way down the slide. Super high sidewalls for maximum safety. The flared edges are easy to grab creating a super safe climbing ramp. Curved landing properly position your child for a safe exit with their feet on the ground. The Wooden trim and big beam pedestal base for additional reinforcement and stability. Manufactured with the same material that has been used in commercial playgrounds for over 40 years. Backed by Rainbow’s Exclusive Lifetime Warranty. Rainbow’s Exclusive Swing Beam design is engineered with incredible structural integrity and built to last a lifetime. Our Super Duty Swing Beams are secured with a heavy gauge steel Mounting Plate. Utilizing four 1/2″ carriage bolts to secure the swing beam to the base structure creates an ultra-strong thru-bolted swing beam connection point. Our wide stance equilateral triangle A-Frame design is engineered based on the unparalleled stability of our swing beam support legs creating an equilateral triangle for maximum stability. Rainbow’s Exclusive Triple Bracket System is another Rainbow original design that creates three connection points, is adjustable to accommodate any unlevel ground and has a proven track record being utilized on Rainbow Swing Beams for over 3 decades. Rainbow’s Commercial Grade Ductile Iron Swing Hangers are the finest quality, safest & most durable swing hanger ever created. Rainbow Swing Hangers will never ware out and will last a lifetime. All Cedars are Conifer trees which are highly decay resistant and successfully utilized in outdoor environments for hundreds of years. Cedar is highly revered, durable lumber species that is naturally resistant to rot, decay and insects. University studies show Cedar’s high durability to outdoor applications. Independent studies prove that when it comes to environmental performance, natural Cedar is exceptional to synthetic products in every way. While other building materials generate greenhouse gases, Cedar actually removes greenhouse gases from the atmosphere. And unlike plastics and vinyl, Cedar is renewable & biodegradable. Plus, Cedar is sourced from the most sustainably managed forests in the world. Aesthetically, there really is no substitute for the natural beauty of Cedar. Ingrained with decidedly crisp, yet superbly rich, tonal properties, Cedar enhances traditional outdoor home decor and inspires innovative eye pleasing architecture.